W.O.O. 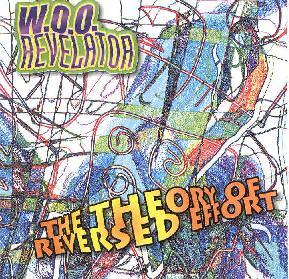 Revelator - "The Theory Of Reversed Effort"
The latest from my favorite spaced out free-jazz trio is a set of instrumentals recorded "live, improvised and fresh from the spheres of each player" in November 1999. W.O.O. Revelator is, as usual, Bonnie Kane on saxophone, flute, and electronics, Chris Forsyth on guitar, and Ray Sage on drums and percussion. "Complex Organisms" is a standard W.O.O. Revelator track. 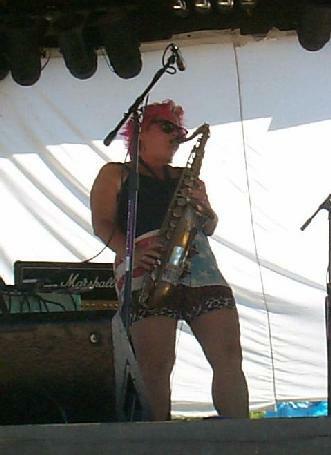 Bonnie's sax opens the proceedings with a slow wailing melody that has a romantic feel. Sage's drums flirt about adding punch to the mix, and Forsyth embellishes the music with quick runs on the guitar. The best part is in the second half when all three break the mercury on the intensity meter, with Forsyth's guitar going from a clean sound to a screeching agonized frenzy, along with waves of electronics (or is it guitar?) that add a spacey atmosphere to the trio's jam. "Windmills In Space" is a short track with heavily phased drones combined with bells and tambourine for a very freaky effect. "More One Way Than The Other" and "Global Communicator" are the true highlights of the album. "More One Way Than The Other" is probably the most spacey track I've heard from the band. The music begins with waves of spacey electronics and jazzy psychedelic guitar along with a sax and drum jam. Forsyth wails on the guitar ripping out strained acidic licks which add a wildness to the music that contrasts but works well with the sax and drums. But this 17-minute track evolves through a number of themes, and soon the guitar takes on a freeform experimental quality and Bonnie switches to flute. Again, it's the intriguing contrasts that keep things interesting, in this case the guitar and flute. The flute goes totally cosmic with what sounds like Bonnie accompanying loops of herself. The efx make for a pretty trippy free-wheeling experience. For the opening of "Global Communicator" the spotlight is on the guitar as Forsyth jams in an avant-country style. Like a cross between John Fahey and Eugene Chadbourne. Wild stuff. But there's plenty of full band action and mucho space effects to give a cosmic kick to the music. A gorgeous freeform freakout jam that illustrates the pure sonic passion of this band. AI: When I review W.O.O. music I struggle for terms and end up combining several, like free-jazz, punk, psychedelia, and noise. That said, tell me about your musical background in terms of your influences and how you got into playing this free style of music. Bonnie Kane: As a little kid I actually studied Flamenco guitar. From age 7 to about 15. I just loved Spanish music and there was always dancing around the house. And my dad bought me a radio when I was about 9 and he'd listen to rock 'n roll with me. So I grew up hearing a lot of music. Flamenco guitar is something you learn to read and I was really good at reading. And I was hanging out with the folksters and rock people. But I couldn't play by ear. I had all this technology and technical skill, and could sight read anything, but couldn't just jam. That was very frustrating for me as a young teen. And I got out of music altogether for a couple years. Also, parallel to that, I was always doing visual art. I started art school pretty much the same time as elementary school in the Saturday program at the Philadelphia College of Art. So during those years when I wasn't doing any music I was finishing up high school, and starting undergraduate school. I went to college really early after my Junior year of high school so I had something else to just totally dive into. I went to the Philadelphia College of Art for two years and was a ceramics major. And then I transferred up to Syracuse University. And while I was at Syracuse, some of the roommates that I'd had had gone to the Chatauqua Institute in upstate New York and had done these music workshops with the Paul Winter Consort. And really it was from my roommates, kids my own age, one was a guitar player, another was a flute player, another was an upright bass player. And so they had this classical background, but because of the Paul Winter thing they had learned to improvise. And that was the bridge I needed. I started playing flute. Syracuse was an interesting place to go to school musically because it was a good midway point for artists touring from New York to Toronto. Or New York to Montreal. So although there was just this little jazz club... everybody came through there. I saw Charlie Mingus there. I saw so many jazz people. Cecil [Taylor] came through there. So that's where I started hearing a lot of music. And also reacquainting myself with playing. And then skipping a few years, I found myself out in Santa Cruz, California. And again, I was influenced by people I hanging around with. And I heard these two guys playing saxophone in this little restaurant. Y'know, "Out" saxophone... not the Kenny G type of stuff. And I'd never really been face to face with a soprano saxophone before. And I was like Ahhhh... I have to play that. And so that's where I started playing saxophone. Also, in a roundabout way, growing up in Philadelphia, I did hear a lot of music as I was growing up in the parks and in the streets, and while I was at the Philadelphia College of Art. And one of the biggest influences was the Sun Ra Arkestra. But it didn't register with me at the time growing up that I could be playing those instruments. Because there were no women in those bands. The women in those bands were either dancers or singers. It wasn't like I thought I couldn't do this... the thought didn't even occur. The women playing music when I was growing up were Joni Mitchell, and I guess Joan Jett was just getting started but I wasn't really into her that much. But there were no role models. So it was through friends, and people I had peer interaction with that I really hooked into playing instruments. So I started with flute. And that broke me out of my classical thing. And I started in on improvisation, and my years in Santa Cruz, California were the years I really started learning about this improvised music, and studying Eric Dolphy, and Albert Ayler, and Coltrane, and Don Cherry. AI: That's very interesting that you said you could read music but couldn't improvise. Yet now that's what you do. BK: Well I had the standard classical musician's syndrome. And there's a lot of classical musicians that have that where you really learn to read, and you really learn to play your instrument, yet you don't necessarily learn to feel it, or hear it, or ply it. And I had to get all the way out of it to come back around the other side. Y'know, you're younger and you're trying to learn everything. When I was in Santa Cruz I was involved with Cabrio College for a while. I was teaching welding there... back to the art school thing. But there was a jazz program there, and the community colleges in California have tremendous music programs, and tremendous jazz bands. But everybody's trying to learn Charlie Parker's licks, and Coltrane licks. But I didn't have that kind of motivation to copy somebody else's thing. I was already clued into trying to find my thing. And it was really an emotional attraction to it. So that's really how it all started. Jamming away with different people. AI: So you started with Flamenco guitar, moving on to flute and then sax came next. So going by your current music and having seen you perform a couple times, saxophone would certainly seem to be your primary instrument. Is that the case now? BK: Well I don't play guitar at all. That's history [laughs]. But concurrent with all this, I was into rock music, and rock bands, and punk music, and psychedelic music. So Hendrix and Sun Ra are ingrained at the same time. They're sharing space in our record collection. I was also into the band thing. Being in bands. The visual art thing is something you do by yourself. You might present it to people. It might be something you're doing a project for somebody. But basically I'm sitting here in my studio making whatever it is by myself. The music thing, although you can practice by yourself and you can do it by yourself, is this whole thing of communicating and creating with other people. And that's what really turned me on about it. So I became really into the whole band deal and... saxophone was basically louder. Especially in those early years before all these great amplifiers. But now it's pretty divided between saxophone and flute, depending on the mood and what's going on within the music. AI: You're the one credited with electronics on your CD's as well. BK: Well I'm a big electro-harmonics fan. And I use a 16-second digital delay, which is the centerpiece of my electronics thing. Basically the tenor and the flute go through the splitter, and I'm using an Octaver box, and Harmonizer, and distortion... a lot of this stuff is pretty common guitar player efx. AI: W.O.O. goes back to the mid-80's? BK: W.O.O. goes back to '85. I came to New York because of computer animation. I'm a computer animator. That's how I make my money. And I really dig it too. It's not just a day job. I really like that. There's something in me that needs this balance of very quiet, concentrated, focused, by yourself, making stuff... and then out there playing in the band. I need both kinds of things. And the whole computer graphics thing was something that I saw that... I can make a living at this, but also use the technology and use the skills in my other work. So I'm doing all the packaging for the W.O.O. CD's. And I'm doing packaging for a lot of other people's CD's now too. So I came to New York in '85 because of computer graphics. And through a bunch of friends I met this guy Glenn Sorvisto, who's a drummer. So Glenn had a basement. And he had this friend Pat, who's a bass player. But we started playing in the basement. And they were the original founders of W.O.O., Glenn and Pat. Except they couldn't get out of the basement. They couldn't book any shows. They loved to play, but they just didn't have much practical bearing, I guess you would say. So Glenn asked me to join the band. And I started getting us shows. AI: I see Glenn on the back of the In Your Own Juices CD. BK: Glenn is still a very dear friend of mine, and he appears with Ron Anderson as part of Happy New Year. He's currently living in Washington, DC, but he surfaces now and again. After the Telescope CD was recorded he decided to go do other things and I basically kept going with W.O.O. But he was the first drummer. And we had a very friendly, amicable, tearful, parting. AI: Going by the couple of early W.O.O. CD's I've got it would seem there were a lot of people involved. BK: Well anybody who's been in a band will know the story of... gosh, I can't keep the bass player, or, now the drummer quit... all these kinds of things. Initially Glenn, Pat, and I had been rehearsing for months, and we get our first big show at CBGB's opening for White Zombie, and Pat quits like a month before the show. So what do you do? Well Ron Anderson was recording part of that Telescope CD with us, and he came in and he played the CBGB's show. Basically we couldn't find a bass player who would commit. So Glenn and I had a crew of bass players. We had like three or four of them. So we continued that way. It still sort of continues that way. So I made a decision at that time when the first bass player quit that I can't let people stop me from keeping going. To build this continual thing so I could look back in ten years and say at least I have this continuity of work and projects. It's very common in a visual art thing where you create a body of work in your life as an artist. I've usually worked in partnerships. And it's usually turned out to be the drummers. Like Glenn Sorvisto. And Ray Sage really was the next person and I'm still playing with Ray. And again, Ray came in because I had a show and I was in one of those interim stages with W.O.O. when the guys quit the band like ten days before the show. And I knew Ray from other bands and he had had a fiery split up with a band and wasn't doing anything. And he and another friend of ours, Jim Fourniadis, who had been a recording engineer for Telescope, they came down and saved me and saved the show, and they were W.O.O for a good period of time. And the Wootopia CD came out of that. We did a tour to Europe together. And the In Your Own Juices CD, the one that has like 12 people on it. So we had this opportunity to do these shows in a theater called Surf Reality Theater, which is really like a loft in the neighborhood. And they're really theater people doing plays and that sort of thing. But Robert, who ran it, really liked our music. So we had the Surf Reality Invitational series and that went on for about a year and a half. About once a month shows. And we kept inviting different people to come and do their thing. 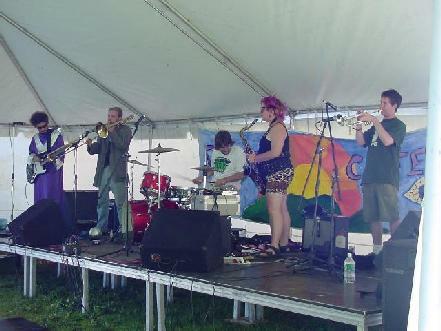 And I was still working in kind of the mixed improv/rock format at that point. The early W.O.O. really came from a harder rock background. All these people were rock 'n roll players, including myself. Punk rock, and this and that. But they liked to improvise. Some of them had really had a good improvisation background. Other people just had a feel for it. But we were working with vocalists and none of the vocalists had improvisation backgrounds and a lot of the guest artists didn't, and what they liked about W.O.O. was they would get to come in and experiment. A lot of the artists, especially the poets and vocalists, had their own career thing already going on. John S. Hall had King Missile going on which was under his direction, but he never got to experiment and go somewhere else. Same with Jennifer Blowdryer and David Huberman. They had their whole ranting scene and poets scene going on. But they didn't get to try it out with musicians. So a lot of people liked the non-committal, experimental way to do it. And I became pretty good at bringing that out of somebody. I know how to explain improvisation to another musician or artist. And how to get them to rise to the occasion, and loosen up. So that's sort of how that CD came about. It's about a year and a half of performances. So that's kind of the path things were going along. I was still playing with Ray and we were looking around for new people. And then I was at a rehearsal studio and I saw this band, and it turned out to be Chris Forsyth, looking for new people to play with. So I later called him up and we just hit it... we had this incredible conversation, we liked a lot of the same stuff. And we started playing and it was just the kind of connection that you live for in terms of music. So that's how W.O.O. Revelator became something. So for the last couple years, I guess that was '98, in terms of W.O.O. I've been focusing on this trio. That's where the energy's been focused. AI: So the last few CD's have pretty much been the W.O.O. Revelator trio. Has it then just been a matter of stability? BK: Well, I wouldn't call it stability. It was just like a fine focus. Being in a band is being in a relationship. Being the band leader you have to be really conscious of that relationship. And by the way, I didn't want to be a band leader. I grew into being a band leader. I became a band leader because nobody would do for me what I needed to do for me. Nobody ever offered to take me to Europe. So I made the choice to do those sorts of things. I booked the shows. AI: The credits on your CD's always say, Bonnie Kane: saxophone, flute, efx, leader. BK: Yeah, I want some credit. [laughs] Well maybe for the next generation of people it will be different. Because there are more women out in different kinds of leadership roles, and independent roles, and musician roles. It's not just the pretty girl singer anymore. But this was something I really had to evolve into. My biggest enemy was my own mind probably. When we were on tour in Europe for instance, people were always coming up to Ray asking about negotiations and such, and he didn't know because I had done it. He'd always be pointing, that's Bonnie Kane over there. Here's something I've been thinking about in this whole avant-jazz thing. Most people, at least from the New York scene, goes by their own name. I've always wanted to have a team type of thing. In the rock world they don't do that. In the rock world it's all band names. In the jazz world it's different. It's all the individual musicians. So I've sort of been in the crux of mixing those two things up. But that's sort of why the leader thing is there. AI: Tell me about the European tour that brought you to Yugoslavia. BK: Well I've done two self-booked tours in Europe. One was in '93 or '94, and one was in '95, and I hope to make it back for 2002. And we did Slovenia, which is close to Yugoslavia and the Czech Republic. The W.O.O. in Huberland CD is from this tour. This is the CD with David Huberman doing the ranting and raving vocals. Ray Sage is on drums. And we took our friend Vincent M�el from France with us. He used to put out a magazine called Hello Happy Taxpayers in the late 80's when he was in New York. Anyway, he was also a bass player. So the four of us did this European tour. And I had like nine days of nothing between shows in the Czech Republic, Switzerland, and Austria. Well the only country that was left in that neighborhood was Slovenia. And I had some contacts and these people said, we'll arrange a whole bunch of shows for you guys. So we went to this town called Koper in Slovenia where we were supposed to meet up with the main people. And these people were just wonderful. They put us up, etc. And there were some politics going on in the town and they said, well you're going to play at the refugee center. And I flipped. This was at the time you saw all these people being evacuated out of Yugoslavia. And the reality of that is once they get to those camps they stay there. And there's nothing to do in these places. These are military installations. They're installations where people can be held and contained. They're not free to leave. These people had been in this camp maybe 4-5 years already. People were growing up in these camps. So the more socially conscious artists of Slovenia had this thing where they were going around and providing entertainment to the refugee camps. So we were taken along with a Dutch band to a couple different refugee camps to do shows. And I was terrified. I mean, New York has the most extreme level of violence I'd ever want to be around. And now New York barely has any violence. So I certainly wasn't interested in this war torn country business. I felt responsible for the band. I didn't want us getting into any trouble or really bad situations. But the other aspect was these people had been through unimaginable Hells. In the United States, we've never had anything like that happen. And the last thing I want to do with my music is disturb some person that's just gotten to sleep or something like that. I didn't want to offend anybody that doesn't have a choice about being where they are. But everything worked out ok. And they were good shows. It was all ages. The grandmothers were there, the little kids were there, the teenagers were there, but there weren't too many adult males there at all. It was a very moving experience. I'm really glad that I did it. Out of the 18 zillion rock clubs and bars and places that I've played, this had to be one of the most unusual situations ever. AI: So a positive experience in the end. BK: Oh yes. At least for us. I'm sure this is something we'll all take with us for the rest of our lives. No matter what happens we'll remember this experience because it was just so intense. It was a military base that wasn't being used by the military anymore except to house these people. The place was filthy. The people looked ok. They were kind of clean, and they were being fed, and they had clothes on. But there was nothing for them to do there. So for these performances, everybody came out to see what was going on. And if they weren't interested they just walked away. The little kids were totally interested. But the kids were crazy. They'd be really into it, and really jumping around and playing with each other. Then they'd start hitting each other and then throwing rocks at each other. Then throwing rocks at the band. Then the adults would try to stop them. It was kind of chaotic the whole time. But it was a really good experience. I don't think it affected the people in there more than entertainment for the evening, but I wouldn't really know. You had the cultural thing. Y'know, we're coming over there looking pretty wild. I certainly didn't look like their mothers or their grandmothers or anything like that. So the kids all thought I was a crazy lady. And I hammed it up. AI: Back to New York. In conversations with others I get the impression that New York isn't as open to alternative music as one might think. But you seem to be playing a lot of shows. BK: I think it's a very vibrant scene. It's all a matter of what you're looking at. Are people making money playing? Nah. People are not making money playing here. But there's tons of opportunity to build an audience and tons of opportunity to be independent. There's always a chance to make a scene somewhere. I think there's a supportive community of musicians. Occasionally there's a couple of long series that are running where people can hang out. It's called the COMA series: Creative Out Musicians Association. It's run by saxophonist Blaise Siwula at ABC No Rio. That's like the last of the underground art spaces in the city. I see it as there's more opportunity now than ever especially because of the internet, and being able to connect with people and festivals. And know about them. And if a person is interested in any niche thing they go and they seek it out. You never used to be able to find this stuff. And now you can. So I see it as just an increasingly open and positive thing. AI: Several of your past releases have been CDR's, but this new one seems to be a manufactured CD. BK: A reeeeeal CD. Chris Forsyth Was really adamant that he wanted to put out what he considers a real CD. I've put out several real CD's. Telescope. Wootopia. W.O.O. In Your Own Juices. Those are all manufactured CD's. I don't want to even into the kind of crazy business deals that I've been involved with in doing those things. The other difference about it was we did go into an actual recording studio. And that was cool. Sure, it's a whole different thing recording in a studio than doing live recordings and then mixing those and putting those things out. You have a different kind of recording quality. You have a different kind of manufacturing quality. And I will say you have a different kind of playing quality. When you have a live show, there's a kind of energy from that that you don't have in a recording studio. The typical show situation is people have worked all day, now you gotta run around and pick everybody up, and you have to haul all your equipment to the club, you get there maybe an hour before your show, you maybe hang out a little bit, there might be 3 or 4 bands... but here in New York you set up really fast because you don't want to lose any momentum from the last band. You don't want the audience to go out to the other bar across the street. So you set up fast and you play. So you have a different kind of musical energy in a live show than you do in a recording studio. One of things if you're going to go to a studio you have to work with an engineer who knows your music. It not just all he does is turn on the knobs. The person has to have an understanding of what's going on with the band. Especially with improvised music. So this was really a luxurious type of thing. But part of this whole thing... we're talking 1985-2001. That's a lot of years. Recording technology has completely changed, and pricing of the recording technology has completely changed. So what's possible for us to do in the year 2000 was impossible to do ten years ago. But I still like live recordings and I'm going to be releasing live recordings. And that's also why I'm optimistic. I guess I have the time in to see how this has all developed. And it's really developed in the independent artists' favor. I'm sitting talking to you and I'm surround by four computers and all kinds of equipment that I couldn't even dream about having ten years ago. AI: You can do so much more on your own. BK: Yeah. You can communicate so much more on your own. You and I are talking on the phone. Ok, the phone has been around for a while. But Aural Innovations is a web site. And people from other countries can check this interview out, and check out all your radio shows. Internet radio is something we're talking about is what... two years old? So it keeps going in favor of the independent niche artist. We live in a country where we probably have the best marketing system in the world. You can sell anything in America. So I have no illusions. I know that the kind of work that I do is going to be this big mass marketed type of thing. Unless they think some day that they can make money from it. But it is a market. And it's a big enough market when you're talking about the whole world that we can all do well. If you're an artist you've gotta do whatever it is you gotta do. So you're going to be doing that whether you're making money from it or not making money from it. AI: Tell me about your trip this past November to Nepal. BK: We had to fly from New York to Pakistan. And then from Pakistan to Katmandu. We spent a month there. We did a 12 day mountain trek. We were backpacking through the mountains on a several thousand year old trade route between India and Tibet that's still in use. But there's no cars or vehicles. It's just all foot traffic, and donkeys, and goats, and cows, and water buffalo, and stuff like that. And then we went down to south Nepal which borders along India, and is actually jungle. And I'd never been to any kind of jungle before. So we were in the jungle for 10 days, and rode elephants, and saw a rhinoceros. And there were tigers there, but we didn't see the tigers. And it was just really a total adventure. AI: Any final news you'd like to share. BK: There's stuff in the works. For World Of Tomorrow, we're going to make a CD of stuff from the Strange Daze show last year and some Knitting Factory shows. So that's going to be the next World Of Tomorrow CD. Then there's some stuff from a personal visit out to California last summer. I did some shows with Ernestro Diaz-Infante. He's a piano player and guitarist. He's part of The First Time CD (reviewed in AI #14). So here was a situation where I was out on a personal visit. No bands or anything like that. But since I was out there I suggested we do some shows, and he made all the arrangements. And we did like 5 or 6 shows, with different duets and trio formats and stuff like that. So there'll be a CD of some of that work coming out. I'm not sure what the next W.O.O. Revelator thing is going to because we're pretty involved in doing the promotion for this one right now. We have this whole campaign going on. Then there's WOOWEB which is our website. The thing that I am steadily trying to grow it into is a boutique of bands, with the projects that I am involved with directly being the centerpoint, and then all of the band members related projects. So it will become a nice stepping off point for that whole grouping of people. The recent redesign of the site hopefully shows this. Also in the near future: there are going to be a slew of releases from Billy Syndrome and Slutfish Records, many of them historical (look out for "2000 Pounds of Joy"), plus new JFK JR Royal Airforce. stuff. I am on a bunch of his stuff and Scott Prato is on even more. Another Friends of Mescalito CD is also due out this spring and is directly inspired by the Nepal trip. And that's about it. Just trying to book shows, and keep playing, and keep recording, and get to some festivals, and tour... just keep going. For more information you can visit W.O.O. Revelator at the WOOWEB site. Contact via snail mail c/o W.O.O. Direct/Sweetstuff; PO Box 249; Knickerbocker Station; New York City, NY 10002-0249.